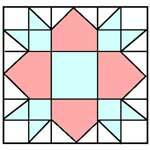 This sweet Grandmothers Cross quilt block starts as a nine-patch block and sports a border that features triangles on four sides to create the central cross motif. 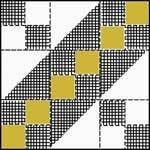 This pattern looks great using coordinated colors or a basic division of light, medium and dark color scraps. 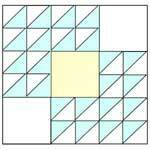 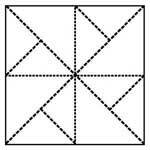 Historically, this quilt pattern was commonly made of woolen pieces and tied rather than quilted. 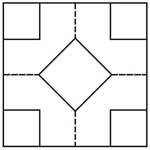 Cardboard or cardstock pattern pieces are the easiest way to cut the odd-shaped pieces with precision. 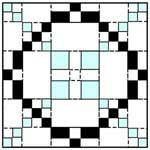 This pattern is often banded with matching strips of fabric to bring out the design with squares to complete the ends of the strips. 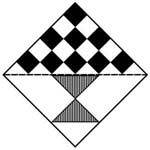 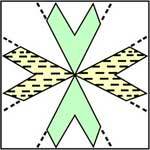 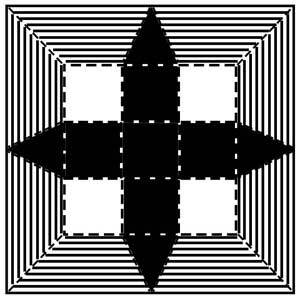 Click on image to print the 5" block of the Grandmothers Cross Quilt Pattern.